This is a temporary display option that I use. I have some neat things I have collected that are waiting for a home. I love being able to see them and they aren't collecting dust. I have just set them on a shelf in the boxes, but then the boxes got dusty and plastic doesnt clean up that well over time. This is a cheese dome that I picked up at a thrift store or a yard sale. It came without a base. (not sure why these end up with out a base since they are glass and seems to me more likely to break the glass and have an extra base, but that is neither here nor there) Anyway, I made a base for this out of foam core - two layers one to fit inside the dome and the other the dome can rest on. 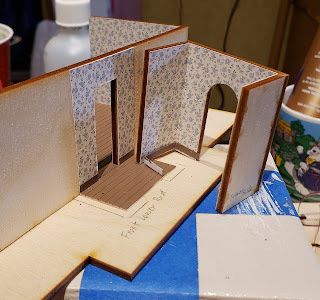 I covered the top layer with flooring and painted the bottom layer. I also added a turntable to the bottom. I started with just keeping this in my workroom, but later decided that I would enjoy the goodies inside more if it was in my kitchen on the bar. This cheese dome is under 3" in height inside so a room or two could be built into it instead. It could be still be a temporary display area but just set up like a room. I have been thinking that I would like to display some more of my not yet placed items, shelves is what I am thinking about. This particular dome is a 1/12th scale, but could work in 1/48th as well. The reason I show this is that a similar type display to this is what I may create to display various 1/48th scale items. 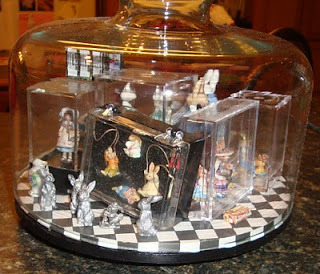 In this example it is actually a permanent location for my bunny collection, but it could easily be a temporary solution as well. 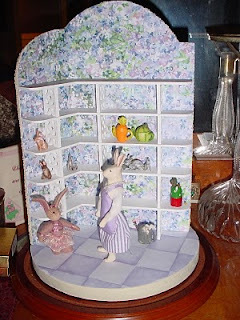 Instead of the back being a garden scene, it could be two side or three sides of shelving. Love the cheese dome, Preble. That was smart of you to make a replacement base; most of us would have just passed on a dome that didn't have one.